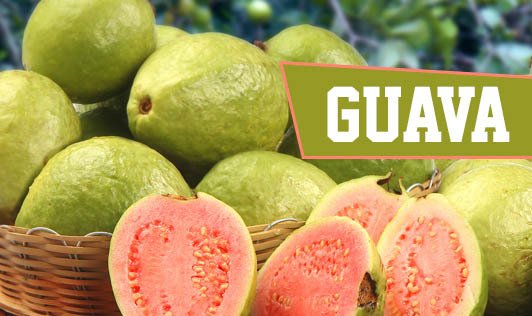 Guava is one of the most delicious fruits and is often hailed as the apple of the tropics. The common guava is a reddish fruit with a dark or light green colour. A medium sized guava weighs about 80-100 g and all parts of the fruit are edible. The flesh is cream coloured and has numerous seeds embedded in it. The fruit is an excellent source of vitamin C and a good source of fibre. It contains 4 to 10 times more vitamin C than do some citrus fruits. The vitamin C content of the fruit increases with maturity and is maximum when the fruit is fully ripe. Vitamin C is an essential nutrient and performs various functions in the body. Guava is usually eaten as a fresh fruit as it is sweet and juicy. They are also canned or made into jellies, jams, and preserves because of their high pectin content.